For some people, even upgrading to 14K gold does not alleviate their skin sensitivities or allergies to metal, especially nickel. Even in more pure forms, gold and silver are often still alloyed with small amounts of nickel. In the past, someone with severe metal allergies had to purchase expensive titanium or platinum earrings in order to be able to wear them. Today there are also coatings available on the market to buffer your skin from the offending metal. This is not a permanent solution however. 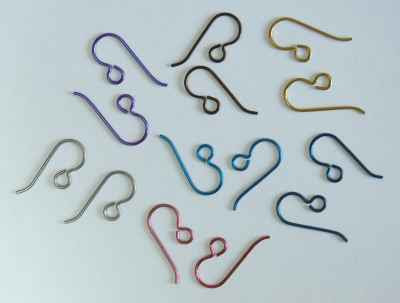 For a less expensive, permanent solution try niobium ear wires. Niobium is so affordable, it isn’t just for people with skin sensitivities. Niobium is a silver gray colored metal. However, it can be anodized with differing thicknesses of niobium to produce an array of exciting colors. Add some color to your ears and be kind to them as well. My niece has loved Hello Kitty stuff and the color purple for a very long time. When I tripped across a pair of earrings featuring Charmmy Kitty (Hello Kitty’s cat) with purple bows in TangerineDog’s Etsy shop, I knew that my niece would love them. Only one problem, she doesn’t have pierced ears and rarely if ever wears earrings. Crafting to the rescue. Instead of just using the Charmmy Kitty charms to make something that my niece might actually like and use, I decided to give her the charms with a promise to have her over and make some jewelry out of them for her to wear. A couple of weeks later, my niece came over to craft her jewelry. 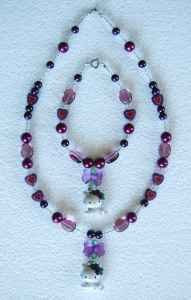 I prepared by pulling out a selection of beads that I thought would go well with her charms. We talked about what kind of jewelry she wanted to make using the Charmmy Kitties and which beads she liked. She decided on making a necklace and a bracelet. We figured out how long the necklace and bracelet should be and began to design them on a beading board. We talked about what colors looked good together and while I guided the design, my niece had the driving vision of what beads she wanted to use and ideas of how to group them together. What skill do you have that you could share with someone as part of a birthday, holiday or just because gift? I hope that you can think of something, since you and the recipient will be enriched beyond the giving of the physical gift. Time is a precious commodity that is wonderful to share. 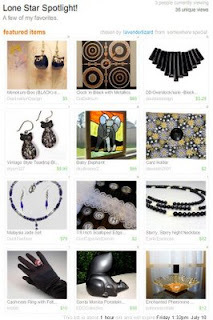 Vintage Items Featured in Etsy Treasuries Too! 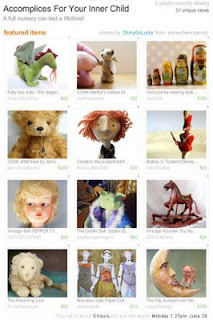 A couple of my handmade items found their way into Etsy Treasuries earlier this year. Since then, three of EDC's vintage items have been featured also. Click on the images below to see enlarged views. 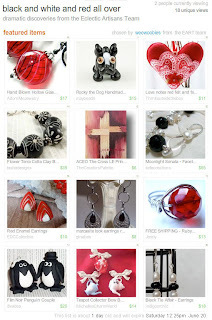 EDC's red enamel earrings were featured in the Black and White and Red All Over treasury. EDC's vintage wooden toy rocking horse was featured in Accomplices For Your Inner Child. 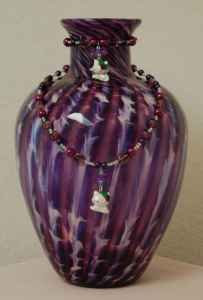 Most recently, EDC's Santa Monica porcelain squirrel was featured in the Lone Star Spotlight treasury. I recently found out about a neat project. This will be its third year. It gives artists free promotion in exchange for helping create a beautiful, artistic diary. I submitted my request to reserve a page and was accepted! You can get a sneak peak of my page below. Click on the image to enlarge it. I picked images from my work that bring to mind what March has meant to me. Where I have lived, March is a transition month from winter to spring. Flowers and butterflies begin to appear along with the ladybugs. However, a chill can still blow in and make you long for a nice cozy fire to sit next to. 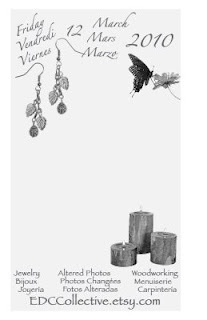 Visit the Diary 2010 Project's main page to find out more information and get ideas for creating your own page. There are still several pages available. The submission date for your completed page is fast approaching however, so check it out today.